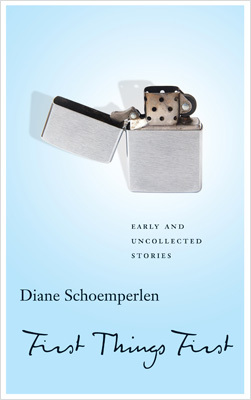 First Things First gathers eighteen of the best of Diane Schoemperlen's earliest and uncollected stories, with several being published in book form for the first time. Playfully inventive, comic, moving, and profound, this collection will reinforce Schoemperlen's importance as one of the leading short story writers of her generation. Diane Schoemperlen is the author of twelve books, most recently By the Book: Stories & Pictures. You clash with my constructed atmosphere. The stories of First Things First feel so much like confidences. They are essentially the intimate thoughts of twenty-four women whose inner life is at odds with the outside world. Some of those ladies simply have peculiar—if not disturbing—personalities. Others construct elaborated narrative to cope with their struggles: loneliness, separations, poor relationships, the contradictory needs to conform and be unique. What emerges from those short fictions is a powerful and unfiltered portrait of womanhood. There is a better way, a much better way in the world to be known, and I have used it here. Schoemperlen is incredibly talented at exposing the dual identity of her characters. She reveals their conscious effort to appear socially proper and emotionally stable, while in their mind are raging anger, sadness, frustration, or even insanity. The best part of most stories was seeing the real personality and true feelings of the protagonist showing behind the façade. One of my favourite short story was “To Whom It May Concern”, a collection of letters penned by a woman in the process of divorcing. You get a deeper understanding of the protagonist with each letter because she’s showing a different self to the recipients. The letter to her in-laws is a lesson in passive-aggressiveness! It’s also interesting how many characters reinterpreted reality so it would hurt less. “An evening in two voices” describes the conversation of two women about the memory of an evening spent together with their spouse. Soon, it appears that one of them has distorted her memories to shield herself from the pain it yielded. Similarly, “The Climb” is about a woman, in love (or wanting to be in love? ), who continuously misread the man she’s hiking with in an attempt to make the moment feel romantic. Beside all this, I really enjoyed the discussion First Thing First‘s stories bring up about the role of women in society and in a relationship. “The Long Way Home” is the contrast between two friends, one holding fast to the traditional role of housewife, and the other focusing on her career. However, they seem envious of one another’s life. It’s one of the book’s stories that expose the difficulty for women to redefine their role in a changing society. Also, First Thing First repeatedly shows women trapped by relationships or the search for one. Most relationships in the books are unhappy, although most women have done considerable efforts, if not sacrifices, to make them work. She’d often wondered why women spend so much time doing things to make men fall or stay in love with them, while the men all expect to be loved just the way they are. As a whole, the stories feel like an encouragement to women to break the mould, pursue a passion or a career, feel entitled to their feeling and be themselves. There was a certain freedom in not wanting to fall or be in love. I really enjoyed how First Things First avoids clichés and attempts a brutally honest depiction of the woman’s mind. Schoemperlen has an impressive talent of portraying how her characters appear on the outside as well as how they feel inside, thus revealing enormous contradictions. Her stories can be funny, cynical, or both, but they are always insightful and thought-provoking. The fact that the stories were written during a sixteen years time span add another layer of interest since society changed considerably during those years. A very strong and powerful book! I have this book, but have only read the first couple of stories in it so far. I like that they’ve put them into chronological order, a literary journey through the years! Yes, and you do see her style and themes progress over the years. I found that the story got better and better!